YOU WONT FIND OUR HOMES IN ANY KIT OR PLAN BOOK! Yes. We use Plantation Timber which is a renewable resource. The trees absorb carbon di-oxide which help to reduce greenhouse gas emissions. The very high insulating capacity of solid log assists in helping to reduce the need for cooling and heating, thereby reducing the need to burn fossil fuels. Our logs are NOT CCA (Copper Chrome Arsenic) treated. However, after hand peeling the bark, the inner layer (cambium) does receive a hand painted coat of anti fungal and mould preparation before air drying and applying water dispersant oil stain. A conventionally built house with weatherboard, insulation batts, and interior lining has an insulation value varying from R2 to R4.5. The log cabin has insulation values of between R16 to R20. Log cabins are great insulators. Warm in winter & cool in summer. 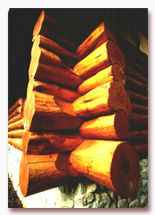 Our log homes use 14" and 18" diameter whole logs. You probably already know from personal experience that it is easy to burn kindling. No one with any experience in starting a camp fire would commence with timber that is not split. The logs are laid horizontally and have no gaps between them. This means that flames can not take hold easily. Needless to say, the logs will be scorched in a fire, but can be cleaned up effectively by sandblasting. 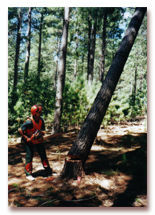 A solid log home has no more, nor less, problems with termites compared to any other form of timber construction. 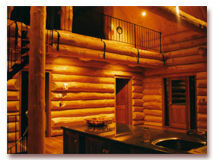 The proper use of mechanical and chemical barriers will prolong the life of your log home. In Europe and North America houses constructed in this manner are still in good condition after more than 150 years. A solid log home can be built on any foundation. Stumps and concrete slab foundation are suitable, but log homes are ideally built on a basement foundation. We use Monterey pine grown in Victoria for our construction. Logs are delivered to our construction yard in lengths up to 12 metres (40 feet). The logs are then hand-peeled and pressure washed. Our reason for using a softwood is that shrinkage during the drying process is about 5%, whereas hardwood can shrink up to 15%. Also, the softwood provides better insulation because of the nature of the timber which has more air infiltration through the grain. Most of the plumbing and electrical work is run through the log walls, and the dry walls built internally. We can use any type of material: Aluminium, timber, steel and plastic. 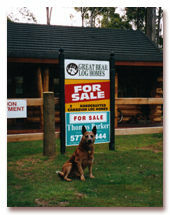 Our price per square is equivalent to any other quality custom built homes. Our homes are truly hand crafted. You just happen to get more for your money in more ways than one! Yes, if you have friends, or relatives, staying with you there is a problem getting them to leave the atmosphere of the home.